BODYWORK & GRAPHICS: Those who ride a KTM 150 SX thrive on the extra power it delivers, while still having the dynamic agility and feel that a 125 cc offers. These riders are always pushing themselves and their machines to the limit and need the freedom of movement to position the bike where they want it on the track. With input from KTM factory riders, KTM R&D as well as Kiska Design, the bodywork on the entire SX range achieves perfect harmony between rider and bike, providing the manoeuvrability the rider expects and the control he needs. The bodywork also contains intelligent design elements, like the I-beam structure on the front and rear fenders, which guarantee maximum stability without adding any extra weight. The new graphics suit the aggressive nature of the bike and further enhance the high performance style of the bodywork. DECALS: New graphics convey the READY TO RACE character of the 2019 SX model line. CHASSIS: The KTM 150 SX is just made to be ridden aggressively, resulting in the development of a new chassis that is light and responsive enough to further enhance its dynamic reputation. 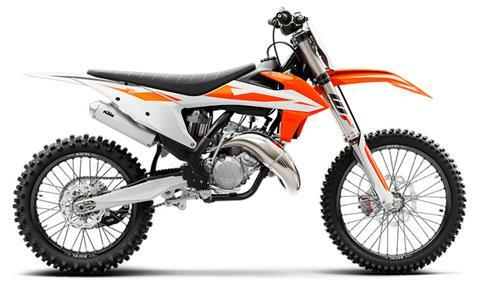 For 2019, the KTM 150 SX features a new lightweight, high-tech steel frame that not only responds well to aggressive inputs, but has also been optimized to provide exceptional feedback to the rider. The new flex characteristics soak up those unwanted hits while also delivering excellent agility and high-speed stability. As a whole, this new chassis gives the rider the confidence to be 100% in charge of the ride. ENGINE & EXHAUST: The pure exhilaration that this bike's engine delivers warranted further development and continued production. As it shares many of its key components with the class-leading 125, the cylinder, cylinder head and piston unit can now also be fitted on a 125cc engine base, converting it to a 150 SX without having to replace the crankshaft. Compact and powerful, this innovative 2-stroke engine is a lightweight powerhouse that makes perfect sense. CYLINDER: This compact cylinder with a 58mm bore features a cutting-edge power valve unit with a sophisticated mechanism for the lateral support exhaust ports. Matched to a twin-component cylinder head, it is KTM’s secret to all-round grunt. The layout of the water jackets in the cylinder and head guarantees efficient heat dissipation when the going gets tough. TRANSMISSION: A robust 6-speed transmission was designed specifically for the small 2-stroke engine, its gear ratios are perfectly in sync with the 150’s power band. The latest production technologies allow for compact dimensions and minimal weight. An advanced ´No Dirt´gear lever design prevents mud from clogging the folding tip for reliable shifts even in the worst conditions. CARBURETOR: The KTM 150 SX is fitted with a MIKUNI TMX carburetor. This 38mm flat slide carb lives to provide smooth and controllable power all the way up to the rev limitation. With a new intake manifold the carburetor is turned 7° in order to reduce the overflow of fuel. And it’s less sensitive to different altitudes and temperatures, so you can pin it wherever, whenever. ERGONOMICS & COMFORT: When it comes to attacking the track, chasing faster times with every lap,there is no better weapon than the KTM 150 SX. Its performance-inspired design allows the rider to shift his weight quickly and easily, working in perfect harmony with the motorcycle. KTM has focused extensively on creating bodywork and ergonomics that are shaped for high-level performance, ensuring a riding position that offers the best riding position for control. A rider's main interaction with the bike isthrough the bodywork, footpegs, handlebars. No compromises were made in these important areas and only the best quality products and designs can be seen on all SX models. KTM produces dynamically fast motorcycles and every effort goes into making sure the rider has the ability to confidently control it. SOFTWARE & ELECTRONICS: Absolute performance purity is the name of the game when it comes to electronics and the new KTM 150 SX. Undiluted 2-stroke simplicity, with an hour meter to keep a check on how long you've been shredding and an optional rev counter to assist with perfect setup.